One of our clients was very interested in our geometric collection based on the golden number Phi and parabolic curves. They wanted something very subtle to be the finishing touch to their fantastic ground floor extension in the kitchen as a 2.5m splashback. 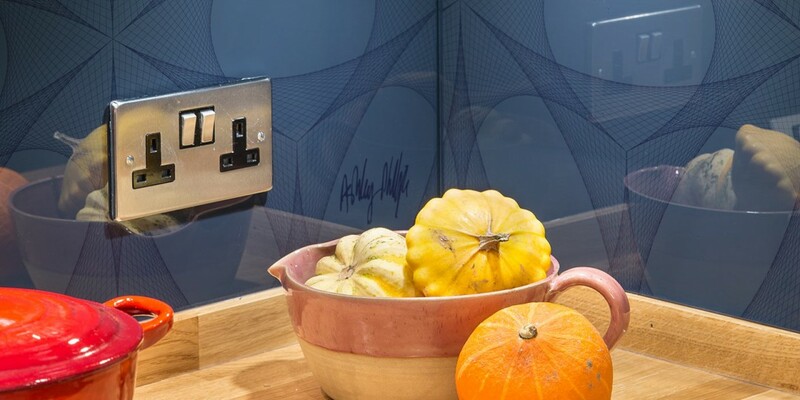 Our client only wanted the splashback if we could perfectly match the bespoke dark blue charcoal colour they had used as the accent colour in their kitchen. Many colour sample print tests were done to check the colour which we had to tweak so that the colour looked the same even through glass. The way light refracts through (even low iron) glass can change the colour that is an exact match, so we increased the saturation slightly to counteract the loss of colour with the glass refraction effect.